Toby started selling books while a student to fund his book-buying. He was a full-time bookseller for 35 years and his wife Chris joined him as cataloguer and partner in the business over 20 years ago. Toby owned a very popular bookshop and was a regular at PBFA bookfairs and the manager for some years of the Oxford Fine Press Bookfair. 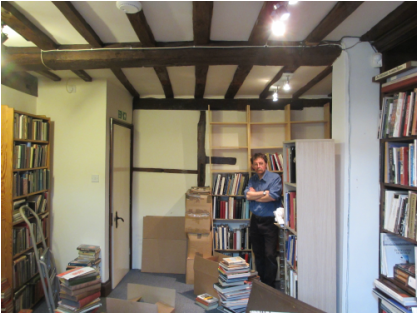 Toby died in July 2015, only two months after closing the shop - he is pictured during the unpacking of boxes in the office. In the centre of Wallingford, a pretty market town on the Thames, the office contains books on many subjects, especially Art, Architecture, Childrens and Illustrated Books and Literature with an emphasis on the scholarly and unusual. Visitors welcome by appointment, please phone first, opening hours are erratic. On the internet since 1998 via Abebooks, Amazon and Antiqbook. Quirky and non-book items are mainly listed on ebay.